(circa 1115 - October 25, 1180) U.K. Beyond the fact that he was of Saxon, not of Norman extraction, and applies to himself the cognomen of Parvus, "short," or "small," few details are known regarding his early life. Scholastic philosopher and latinist, born near Salisbury, Wiltshire. He studied in France at Paris and Chartres under Peter Abelard and other famous teachers. In 1148 he resided at Moutiers la Celle in the diocese of Troyes, with his friend Peter of Celle. John was a leading figure in the renaissance of the 12th century. He was thus brought into intimate relations with princes and popes, especially with Henry II and his chancellor, Thomas Becket, and with Pope Hadrian IV, also an Englishman (with whom he was rumored to be a lover). He served as secretary to Theobald and St. Thomas Becket, archbishops of Canterbury. He wrote Historia pontificalis (c. 1163). His two main works are the Polycraticus, a treatise on the principles of government, and the Metalogicus (both 1159), which presents a picture of the intellectual life and the scholastic controversies of the age. 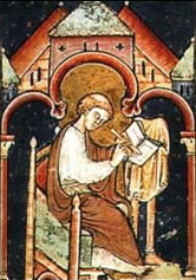 His defense of Becket and of ecclesiastical liberties led Henry II to exile him to France (1163). John settled in Rheims with his longtime friend, Peter of Celle, then abbot of St. Remi. He returned to England after the reconciliation of Henry and Becket and was in Canterbury Cathedral when Becket was assassinated. He later wrote a hagiography of Becket and promoted the cult of the murdered archbishop. From 1176 to 1180, John was bishop of Chartres, France, where he died. He was interred in the monastery of St. Josaphat, near Chartres. As bishop of Chartres, he was active in the third Lateran Council.